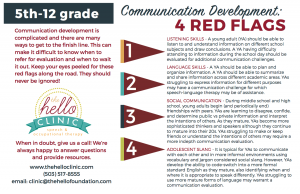 Communication development in young adults is often overlooked at well-child checks and at school. There is a ton of attention paid to the early developmental milestones (and rightly so! ), but communication continues to develop into young adulthood and kids can struggle anywhere along the way. Communication challenges at this age can be particularly troublesome as the academic workload increases and social interactions become more involved and high-stakes. Listening skills – Does your young adult (YA) listen to and understand different school subjects and draw conclusions? Language skills – Does your YA plan and organize information, summarize and share? Social communication – Does your YA know what to keep private and what to share publicly? Does your YA interpret the intentions of others? Adolescent slang – Does your YA switch between informal social slang with peers, and know when it’s more appropriate to use formal, standard English? If the young person in your life is struggling in any of these areas, give us a call. Chatting about kids with parents and other professionals makes us happy! We will help however we can, and refer you to other helpers if we’re not the right fit. Please feel free to share! Click on the image or link to download a free copy, and contact us if you have any questions or would like us to send you a hard copy. Click here to download a free PDF of this Brochure!